Following the events of “Mirrors and Smoke”, the Lukari and Kentari began efforts to work together. The culmination of this effort is the Dranuur Colony in the Alpha Quadrant. Both races will try and see if they can coexist peacefully, or if it is all but a pipe dream. With any luck, the two races will learn a thing or two about the other and how they can better their own lives. With Season 14: Emergence, Dranuur Colony will become available as a new joint Lukari-Kentari-themed Fleet Holding, available to all Fleets in Star Trek Online. Your Fleet will assist the two races as they establish and develop an island on the newly-terraformed world. 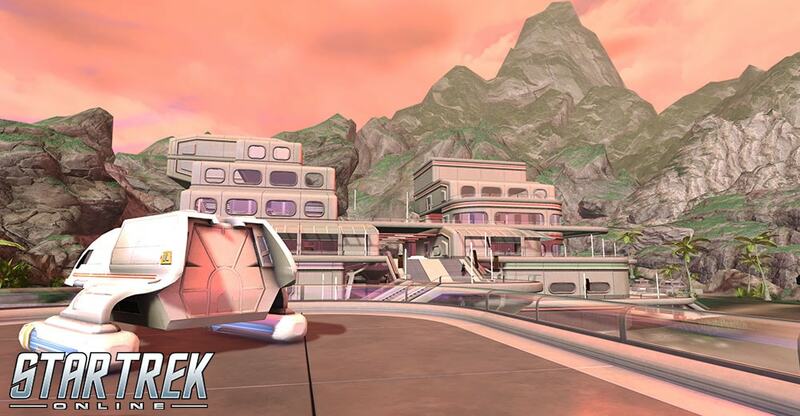 For the first time since the introduction of the Fleet Starbase, player fleets will be presented with a full-sized Holding, comprised of a primary track and three subtracks, each with five tiers of progression. Each tier and subtrack will offer fleets new improvements to their Colony World holding, as well as access to new equipment, and new gameplay options. Those will be detailed further along in this dev blog. One feature that makes the Dranuur Colony unique is that, instead of purchasing provisions in your replicator, players instead work alongside the colonists to claim resources from the environment around the colony, to be used for track progression. Each subtrack will have its own resource, and all three resources will be needed to upgrade the main track. As you progress in the various subtracks, you will find it easier to attain the resources, and your fleet will even be able to automate a part of the resource-gathering process. In addition to earning the resources by participating in activities around the colony, your fleet will be able to enact training simulations for potential invasions – the Kentari haven’t survived this long without a healthy helping of paranoia, after all. Simulation Provisions (used to start the invasion simulation) will can be earned by completing fleet projects and can be used by your fleet leadership to trigger these map-wide invasion events. As your fleet advances, new simulation options will become available, allowing you some customization of the training simulation experience. Additionally, it will become easier to earn a stockpile of Simulation Provisions as you progress in the main track. The invasion simulation is a multi-location wave defense event, which allows up to 20 fleet members to participate without needing to queue – simply travel to the Dranuur Colony, and start the event! After every five invasion waves, participants will be given a vote to stop and claim the rewards earned so far, or continue on to more difficult waves, risking their earned rewards in the process. Victory in this simulation rewards players with resources and Fleet Marks used to progress the Colony holding. This progression track represents the culmination of your progression in the three subtracks. Advancing this track primarily grants improvements to the Invasion Simulation gameplay. This Track will present players with a special reward unlock upon reaching Tier 5, but we are not yet ready to announce these details. Watch for a future announcement! This track represents the influence of the Lukari efforts on Dranuur. It has a primary focus on scientific endeavors and rewards, but also includes powerful ship upgrades. This track will require Renewable Batteries as an input for most projects. Leaning upon Kentari expertise, this track represents their industrial ingenuity. Most rewards in this track are armaments for your ship, captain, and away team, but additional amenities may also be earned. This track will require Ore Provisions as an input for most projects. In a community comprised of very different philosophical and political ideologies, it’s important to keep everyone’s morale as high as possible. Rewards from this subtrack are primarily improvements for your away team, as well as additional colony amenities. This track will require Luxury Provisions as an input for most projects. Fleet Holdings are large projects that require multiple players in order to progress and earn rewards. In preparation for the release of this feature, we will soon be unlocking the ability for Fleets on the Tribble Test Server to progress at an increased speed, using resources supplied at the Drozana Test Vendor, in order to help us ensure that all of the work players will put into progressing their fleet’s new holding is as polished as possible. Watch for Tribble Patch Notes to see when this feature becomes available for public testing, and send us your feedback! Best of luck, Captains! The future of the Lukari-Kentari Joint Initiative is in your hands!